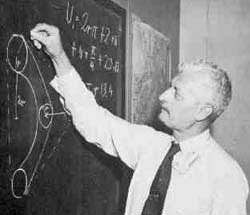 The hotbed of rocketry was Germany, where Hermann Oberth, a transplanted Romanian, vigorously promoted the idea of spaceflight, even though his doctoral thesis "The Rocket into Interplanetary Space" was rejected by the university of Heidelberg. Oberth was an early member of the "Society for Space Travel" (Verein für Raumschiffahrt or VfR) formed in 1927. In 1930 the VfR successfully tested a liquid fuel engine with a conical nozzle which developed a thrust of 70 newtons (about 10 newtons will lift 1 kg). By 1932 it was flying rockets with 600-newton motors. Together with Frank Malina, one of his graduate students, Karmán began designing and building rockets at Caltech's Guggenheim Aeronautical Lab (supported by the Guggenheim family which also financed Goddard's work). Because rockets had a dubious "far out" connotation, they referred to their work as "jet propulsion." Ultimately Karmán and Malina established at Caltech a laboratory devoted to rocket work, the Jet Propulsion Laboratory (JPL); today JPL is virtually part of NASA, a large lab specializing in the exploration of the solar system beyond Earth. Another distinguished student of Karmán was Hsue Shen Tsien, who later returned to China and helped establish that country's spaceflight effort. Today of course almost every space rocket uses several stages, dropping each empty burned-out stage and continuing with a smaller and lighter booster. Explorer 1, the first artificial satellite of the US which was launched in January 1958, used a 4-stage rocket. 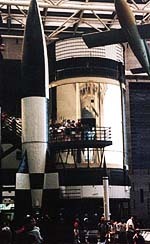 Even the space shuttle used two large solid-fuel boosters which were dropped after they burned out (the "Challenger" disaster in 1986 occured when one of them failed). The fuel for the shuttle's own engines--liquid hydrogen and oxygen--came from a huge detachable tank. As that fuel was used up, the boosted mass decreased, and by Newton's 2nd law, the acceleration increased steadily (it is hard to reduce the engine's thrust, though the shuttle could do so to a limited degree). To reduce the acceleration and save the astronauts and the vehicle from excessive stress, at a chosen point in the flight two of the three engines were shut down. Even then, when the last fuel in the tank wass burned, the acceleration reached about 6g, pressing each astronaut down with an added force 6 times his or her body weight. The second "Bumper" rocket launch, in 1950, which was also the first launch from Cape Canaveral. Picture here.